I have lots of bookmarks, not only in Firefox but also in Internet Explorer and Opera. It happens sometimes when I open a bookmark that I have not opened for a while that the link points to a dead url which makes me search for mirrors or cached versions of the page. Ultimately, I will remove the link from the favorites because it is dead and most likely will not be revived at a later point in time. Sometimes, I replace it with an alternative but most of the time, it gets deleted right away. Would not it be great if there was a tool that checked the bookmarks automatically for dead links and duplicate entries? A tool that reads bookmarks from multiple web browsers installed on your system, including Mozilla Firefox, Internet Explorer and Opera? I'd assume that the majority of Internet users would like to use such a program from time to time. If you are one of those users, you may find that AM-Deadlink is the program that you have been looking for. Am-Deadlink is freeware, just download and install it on your computer. You have a drop down menu in the upper left corner of the program window that you can use to select a web browser or file type to check. The program should recognize the installed browsers right away and display the bookmarks of them in its interface on selection. If you have installed multiple versions however, it may identify the wrong profile or browser version. Selection Options > Settings > Bookmark Files if that is the case and edit the path information for Firefox, Opera or Google Chrome manually so that they point to the right browser profile. This is also the way to go if you want to check bookmarks of portable browsers. AM-DeadLink can load bookmarks from files as well, for instance HTML files, comma separated value lists or url files. This can be useful if the browser that you are using is not detected automatically. Most web browsers offer options to export the bookmarks as HTML files. Firefox does so for instance. Press Ctrl-Shift-B to open the Bookmarks Library. Select Import and Backup > Exports Bookmarks to HTML to save them as a HTML file. You can import the checked bookmarks later on again in the same way (select Import). To check all bookmarks click on the check bookmarks button in the interface. The program tries to connect to all sites listed here and updates each website's status once it has done so. The most important columns are the error and status columns. Status highlights whether a connection attempt was successful or not, while error displays the error message when connection attempts were not successful. You can sort all bookmarks by error or status, which I'd recommend as it helps you go through broken bookmarks more easily. 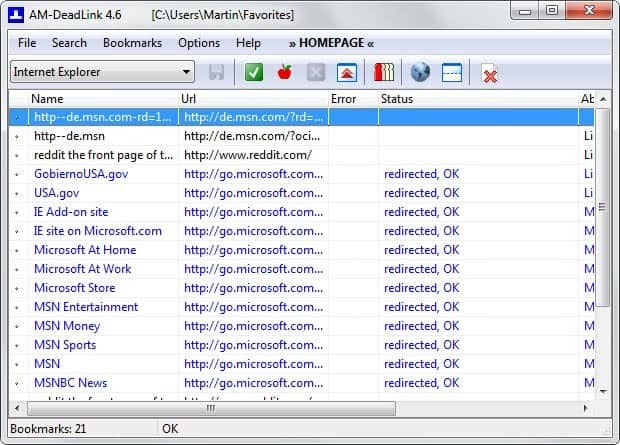 You can recheck bookmarks easily and as many times as you want. Broken bookmarks can be deleted by selecting them and tapping on the delete key on the keyboard, or right-clicking bookmarks and selecting delete this way. Note that deleted bookmarks are removed from the browser right away. Sometimes, you may want to keep a broken bookmark to recheck it at a later time. This can be useful if you get connection timeouts when trying to connect to it. This may indicate server problems at the time of testing. AM-Deadlink has the ability to backup the bookmarks as a zip file, but there is unfortunately no option to import bookmarks from one browser to another directly. You may export bookmarks in a universal format and import them later through your browser though. There is also no option to merge bookmarks right in the program, for instance to remove duplicates or to work with a single bookmarks file in all your browsers. You can check bookmarks for duplicates though via the bookmarks menu in the program window. Update: The latest program version supports Google Chrome bookmarks as well, and can download favicons for Microsoft Internet Explorer favorites and Opera bookmarks. You can use the Ctrl-Shift-F9 key to check bookmarks and download favicons for all sites during the process. A double-click on a bookmark opens it in an internal browser in the program window. This can be useful to check if a site is indeed down. You can switch to an external viewer with a click on Options > Use Internal Browser. I have a ton of bookmarks too, and it’s nearly impossible to monitor them manually. This AM-Deadlink tool sounds like just the thing I need, so thanks for the tip!! The problem with AM-Deadlink is that it will not allow you to remove both duplicates manually (even if you KNOW what you’re doing! ), will not let you rename bookmark, and worst of all: it WILL delete both copies of a duplicated bookmark – just if you change sorting options. It DID happen to me with latest v3.2 version. I am using a LinkCollector for check links and search duplicates.